Dorothy Elizabeth McNair died Wednesday, October 10, 2018, at Madison County Nursing Home in Canton, MS. She was 99. 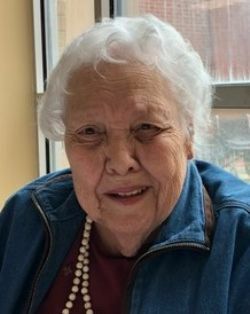 Dorothy, Dot to many, was born on June 23, 1919, to Louis Wilson and Euna Rollinson Thomas in Kilbourne, LA, where she grew up with her brother and four sisters on their family farm. After moving to Vicksburg she met and married O'Bryant McNair and began a family. Dot was an active and energetic person who enjoyed cooking and staying busy. She loved spending time with family and friends and engaging in numerous activities at her church. She is preceded in death by her parents, her husband, and her sisters Pearl Sumrall, Ruby Cromwell, Myrtis Sanders, and her brother Purvis Thomas. She is survived by daughters Debra Dickson (Stephen) of Canton, MS, Cheryl Sims (Russell) of Ponchatoula, LA, and unofficially adopted son Buford Evans of Vicksburg, MS; grandchildren Melanie Dickson Lemburg of Savannah, GA, Jonathan Dickson of Milpitas, CA, Schuyler Dickson of Canton, MS, Kelli Sims of New Orleans, LA, John Sims of New Orleans, LA, and Mollie Sims of Monroe, LA; four great-grandchildren, with two more expected any day; and numerous nieces and nephews. The family would like to thank the many caregivers at Madison County Nursing Home who do their jobs with such generosity and love. Dot's family and friends are invited to come together for a celebration of her life on Friday, October 12, at Porter's Chapel United Methodist Church in Vicksburg. Visitation will begin at 12:00 noon, with the funeral at 1:00 pm and internment following in Greenlawn Gardens Cemetery. In lieu of flowers, memorials may be made to Porter's Chapel United Methodist Church, 200 Porter's Chapel Road, Vicksburg, MS 39180.